Very good turnout at the FDOT workshop this afternoon, it was nice to see the cycling community come out and voice their opinions for this project. 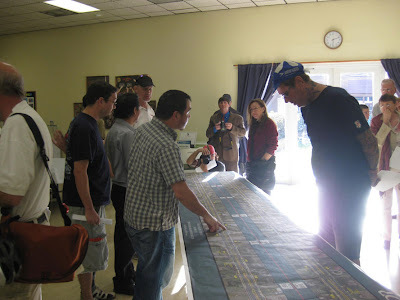 Most of those in attendance rode their bicycles to the meeting and showed genuine concern over FDOT's resurfacing plans for Sunset Drive/SW 72nd Street. FDOT's current plan is for a 'shared use lane'. It's clear that the majority of those in attendance wanted bike lanes, however the present plan does not include bike lanes, instead they wish to widen an 11' lane to 14' and add some "Share The Road" signage. Yes, that's what FDOT is presenting to us! A wider lane which will only encourage cars to speed and some signs reminding motorists to share the road. On the positive side of things a new sidewalk will be paved on the north side of Sunset Drive. Currently there is no sidewalk for pedestrians to use on that stretch of road. Below are a few illustrations of the proposed plan. Various recommendations were made to FDOT by those in attendance. Some asked for an even narrower median, to accommodate the 4' needed for a bike lane (current plans only have 3'). Others suggested keeping both lanes at 11' and adding a 3' foot shoulder instead. I thought sharrows would be a good idea since the "Share The Road" signs alone are not enough but was told the speed limit must be 35mph and under for sharrows. I was also told that FDOT has not yet adopted sharrows into any plans. I encourage all of you to email Gus Pego, our FDOT District Secretary, and let him know how important bicycle lanes in this project are to you. The problem I see with a shared lane is not so much drivers speeding next to you, etc. It's the possibility of cars or trucks temporarily parking next to the sidewalk forcing cyclists (and other vehicles, of course) to go around them. My favorite road treatment is the sharrow ~ but it doesn't make sense here. And it's not just cyclists who should feel shafted. Pedestrians and even motorists would be safer with a bike lane, only one of many steps FDOT should take to improve safety along this historic, literally unparalleled roadway. Hopefully everyone who reads MiamiBikeScene will email FDOT/the Herald/MPO, even just to say - where's the safety consideration here?